BUYSOUNDTRAX Records presents the original soundtrack to A RAISIN IN THE SUN. 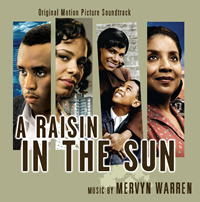 The album features music composed by Mervyn Warren for the 2008 Sony Pictures television film, adapted by Paris Qualles (THE TUSKEEGEE AIRMEN) for the screen from the classic play written by Lorraine Hansberry, directed by Kenny Leon and starring Sean Combs, Tony Award winners Phylicia Rashad and Audra McDonald, Tony Award nominee Sanaa Lathan, along with John Stamos. A RAISIN IN THE SUN is a limited edition release of 1000 units. The first 100 copies ordered through the website will include a booklet signed by composer Mervyn Warren.